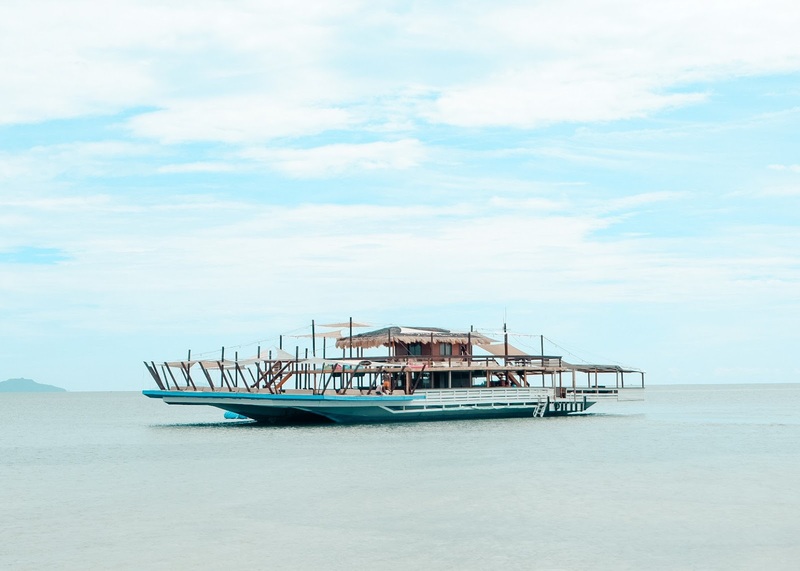 One of the reasons we planned a trip to Negros Occidental was to visit the famous Lakawon Island and TawHai Floating Bar. I have been eyeing this destination for months already so imagine my excitement when it finally came true. We went there on our second day in Negros Occidental and initially, we only planned to go there for a day tour but due to unexpected circumstances before the trip, I decided to book us a room overnight. I thought maybe this would also be better so we could fully enjoy the island because who knows when we would be able to come back. We checked out at White Hotel Bacolod around 4AM. We bought breakfast and then rode a taxi going to Bacolod North Bus Terminal. Around 4:50AM, we were finally off to Cadiz. The bus ride was amazing since we got to see green fields along the way and the sun rise. I was even glad that Zayn was awake throughout the trip. He loved sightseeing by the bus window. I asked the bus conductor how long the trip would take and he said it'd be around 1.5 hours to two. But since it was still early in the morning, the trip only took us about an hour. We dropped off at Burgos Terminal in Cadiz Viejo around 6AM. At the terminal, there were tricycles lined up so we rode one going to Cadiz Viejo Port. We paid Php 120 for the ride. I think that's their fixed rate regardless of how many you are in the tricycle. But of course, the tricycle can only fit 4-5 people. it took us 15 minutes to reach the port. At the port, we booked our tickets going to the island. I have listed the steps below on how you can book tickets. Get priority number from the security guard. Process system reservation (e.g. register guest names, etc.) and print queuing number. Proceed to cash card reloading station. Wait at the waiting area for your queuing number to flash on the screen. Proceed to the cashier to pay and for modification of your reservation. Wait for your boat assignment to be displayed on the screen. Present your receipt to the security guard for scanning and stamp. Proceed to your respective boat assignments. *As of this writing, the NEW Day Tour rate for Lakawon Island is Php 340/person and Php 285/person entrance fee for TawHai Floating Bar . **Day Tour rate consists of the following: Entrance Fee (Php 150/person), Terminal Fee (Php 20/person), and Boat Fee (Php 150/person). Also, please note that even if you booked a room for an overnight stay, you still have to pay the Day Tour rate. We intentionally left very early because based on our research, the first trip going to Lakawon Island is at 7AM. And we wanted to be on that trip. However, we didn't know that there had to be at least 25 people to get on the boat. So we had to wait for more than an hour. Around 7:40AM, one of the guests asked the rest of us if were willing to pay an additional fee (I think it was around Php 30 each?) just so we can leave for the island already. All of the guests agreed but thankfully, the staff said that there's no need to pay and they let us get on the boat. We left at 7:45AM. The boat ride going to the island was okay. It wasn't that smooth because there were waves but it was nothing to be really scared about. We arrived at Lakawon Island at 8AM. So the trip roughly takes around 15-20 minutes. Zayn loves boat rides and he was enjoying the ride going to the island. He would laugh when the boat encounters big waves. Haha. FINALLY! LAKAWON ISLAND! WOOHOO!!! The whole morning since we arrived at Lakawon Island was spent taking photos everywhere because Chad (our friend who went with us) will be leaving at noon. It would only be Zayn, Sheen, and I who would stay overnight. So we made sure that Chad would enjoy the island before leaving and would have a lot of photos to take home. Haha. I booked us the Tropical Bamboo House directly on their website. I don't think you can book anywhere else either. The room is Php 2,500 and it's good for 4 people. I booked it despite knowing that it's a non air-conditioned room because it was the cheapest. And we're staying for only one night so why bother spending too much, right? When we arrived at the island, we headed straight to their front office to try if we would be allowed to check in early. Standard check in time is at 2PM but there's no harm in trying right? Good thing the people who were with us in the boat went to the office too and we all got to check in at our respective rooms. Yay! Around 10AM, we went to the front office and bought tickets for TawHai Floating Bar. We paid Php 250 each for the entrance fee. Children 5 years old and above are considered adults already so they have to pay the regular rate. While we were paying and registering our names, their staff asked us if it would be okay for us to walk to the back of the island since the floating bar was "parked" there. Walking was not a problem for us so we said it's totally okay despite the scorching heat. Haha. So we walked and by the end of the island, we were fetched by one of the staff who got us on a mini boat to get us to the floating bar. They say that TawHai Floating Bar claims to be the biggest floating bar in Asia. And it's definitely one of the reasons why Lakawon Island is sought after by tourists and locals even. Because who gets to get on a floating bar often right? It's definitely an experience you should not miss. When we got on-board, we knew there was no time to waste. There were already a few who got there before us but we knew more people would flock in no time. So we took a lot of photos in almost every corner of the floating bar. We had to get the most out of our Php 250, y'know. TawHai Floating Bar is no doubt a great place to chill. Despite being busy with taking photos, we got breaks here and there where we got to just sit down and enjoy the view. It would've been more perfect if we got to experience sipping a few cocktails while basking under the sun. But we didn't. We were too hungry (and Zayn was with us!) to think about it so when we felt like we were good, we asked the boat staff to take us back to shore and went straight to the restaurant for lunch. Their checking in and checking out process were fast and smooth. Their staff were nice, approachable, and accommodating. Despite the food being very expensive, at least the food was decent. And at least the staff was okay when we asked if we could have our leftover chicken stored and reheated for dinner. We did this to save money on food. Our room was okay. Nothing more than that. The important thing was we were able to sleep well. This feedback is not really about the resort, but there were instances I had to pick up water bottles and other trash left by the guests. But these times, there were staff who saw me picking up other people's trash. I don't mind picking up trash but isn't this their job? I hope the resort will be more strict with regard to garbage disposal. They should penalize littering guests! LOL. Their food are expensive. We paid Php 860 for our lunch: three cups of rice, three lemonades, two bottles of water, one whole fried chicken, and a platter of pansit. There were no other option with the chicken but to get the whole which cost us Php 400. The platter of pansit was Php 250. Paying Php 250 for TawHai Floating bar, I expected the facilities were well maintained. I know it's a challenge to get the sunbeds neat and dry but what's our Php 250 for right? It would have also been better if we got at least a consumable drink because Php 250 just for sightseeing and photo taking is quite pricey, you know. We mentioned that we were asked by the staff if we could walk going to the receiving point for TawHai and we agreed without questions. But when we saw the foreign guests were transported via the resort truck, we thought it was so unfair. We didn't care about walking but it would have been nice if we were given an option too. We were all paying guests but foreign guests received special treatments. In relation to #4 above, Php 2,500 for a hut with average amenities is just too much. The private bathroom didn't have trash bins. The flush was not working. There were times that rusty water came out of the faucet. It was super brown we had to throw all of it. No dental kit was provided. I mean, shouldn't this be a standard? I don't like that they claim they are a luxurious resort providing luxurious experience but their facilities and amenities are mediocre. So is it really worth the visit? For first timers, yes. Just make sure to bring a lot of extra money especially when you love eating. Haha. I don't think we'll be visiting again soon. I believe that one time is enough but who knows? Maybe a few years from now if I change my mind. Wish i knew this while im still in Pinas. great pictures and nice vacation u had. Save ko to para sa next gala dyan. I live in a coastal area, but always love to see great beach like this! Lakawon should be in my bucket list. I have never been in this place but holy cow this place is really beautiful and definitely a highly recommended place to visit. The place has got so many awesome views, looks like an awesome place to visit. Totally worth the time and money. Beautifully penned. This looks so cool! What a fun idea to have a floating bar! It looks so relaxing. I have never been to Lakawon Island but I always wanted to visit. Such a wonderful place. Ella, same sentiments!! Good thing nga di kami nagstay for overnight pero grabe pa rin yung gastos namin. Sana they improve pa, if by then they do, I'll think of staying overnight.